“Parents cannot afford to pay, teachers and providers can’t afford to stay, help us find a better way.” This slogan coined in the early 1990s started the ‘Worthy Wage Campaign’– a movement that intended to bring attention to the low salaries of teachers in early childhood settings. At the movement’s birth, early childhood education was beginning to gain wide-spread recognization for its benefit to children, families, and society. Alongside the recognition came the attention (and funding) of influencers outside the field of early childhood education. This attention and funding propelled the early childhood movement toward national expansion for Universal Pre-k in public and private settings. Today, the movement to provide access to children using a variety of local state and federal funding streams has expanded as states explore different strategies for providing services in diverse settings, with the goal of offering high-quality services to children and families in any setting. The movement toward early childhood teacher compensation parity has been active for decades but has found a new interest in research and policy as publicly funded early childhood systems continue to expand across settings. While standards and requirements for higher levels of teacher education are on the rise, the compensation of early childhood teachers has not kept pace. 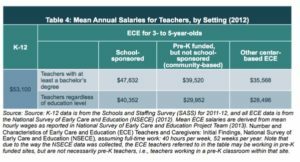 Pre-K teachers in public settings – including those with similar backgrounds and qualification – receive proportionately lower salaries than their counterparts in K-3. Salaries for teachers in private settings are even lower (See below). Some states are finding innovative ways to lessen this salary gap. They are forerunners in exploring ways to create more comparable rates for teachers in publically funded Pre-K in both public and private settings. Workforce development and quality go hand in hand with adequate compensation. To ensure their workforce development efforts address both of these issues, a number of states are taken a two-pronged approach to tackling compensation. SRC has supported the Washington Region Early Care and Education Workforce Network – representing Washington DC and surrounding counties in Virginia and Maryland, as they develop strategies and programs designed to develop a competency-based career pathway directly linking early educator career advancement with compensation. The state of Virginia has made workforce development a legislative priority and to that end has established a Compensation and Finance workgroup charged with developing a set of policy recommendations designed to reach compensation parity across the Commonwealth. The team at SRC, in partnership with the Virginia Early Childhood Foundation, is facilitating this workgroup and will be responsible for putting forth recommendations and key considerations on the group’s behalf in June 2018. A recent report by the Center for the Study of Child Care Employment Institute for Research on Labor and Employment and NIEER highlights how five states (Alabama, Georgia, New Jersey, Oregon, and West Virginia) and two cities (New York City and San Antonio) are moving toward compensation parity in the field of early childhood education. The report provides background on Pre-K financing, addresses challenges faced and describes a number of promising approaches being implemented. Two examples included in the report include establishing required salary schedules for the state Pre-K program (San Antonio, Texas and Oregon) and taking graduated or iterative approach to reaching full compensation parity by focusing on one element at a time. As we continue to advance early childhood to ensure that all children have access to high-quality experiences, we must remember not to leave the teachers behind. Research and best practices such as those contained in this report are steps in the right direction.